Toby may be the class clown, but he's smart enough to know what's what. Whether he's late for school, early for recess, or just in time to fail the next quiz, he's always got something to say about it. But even though his friends think he's funny, the adults in his life aren't laughing--mostly because they're not in on the jokes. No matter! Toby makes the best of it as he coasts through the day on his wit and good humor! Franck Girard is an author and publisher. After publishing children’s books in major French houses as Nathan, Bayard or Milan for years, he created his own company Tourbillon, and more recently its US imprint Twirl. 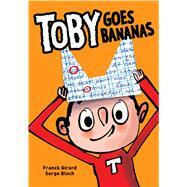 A fan of comics books, Franck has been writing Toby’s jokes books for 15 years, for the joy of French children.